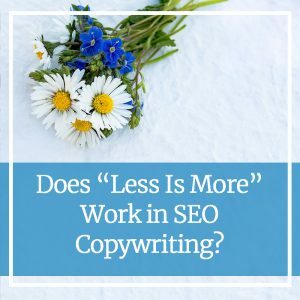 Does “Less Is More” Work In SEO Copywriting? Do many words on a page speak louder than a few? When it comes to writing website content, the argument about “how many words are enough” comes up time and again. And, in fact, the word-count discussion has been around much longer than that. Shakespeare himself once said, “Brevity is the soul of wit.” But, is being brief really the best route to take when writing copy for your website? Last month, we published a blog post that states there’s no right word count for your copy. Instead, there is a balance to be made with your copy. Think about it this way. If a customer wants to learn more about your service by visiting your website, they don’t want to sift through 1,000 words on a homepage to gather that insight. Instead, they want you to deliver an answer to their question, as quickly as possible, but with enough information to help them make a decision. This is the delicate balance between just enough, not enough and too much content. Don’t be thin. You need to have enough content to keep your copy from being considered “thin.” Thin content has a bad reputation with Google, as the search engine sees such content as low quality. If Google sees your content as have little-to-no value, then your content has no hopes of appearing in search results. Ever. The last thing you want is for Google to believe your website is spam, penalizing you with no ranking at all. Don’t fluff. Too much content that adds little to no value to your audience will also result in negative rankings from Google. Why? Because overly fluffed content is usually overly optimized content. I.e., it’s spam. Don’t stuff your keywords. Listen, this is old hat. Google is smart and knows when you’re keyword stuffing to try and hack your SEO. Use keywords organically and naturally throughout your copy instead. Not sure whether your copy might be categorized as overly optimized? If you follow a highly rigid formula for keyword optimization (e.g., the phrase must appear HERE, HERE and HERE, as well as in this type of format and in this header on every page), you’re likely in for trouble. Aim for 350, but don’t settle there. We have found that 350 is the minimum sweet spot for content on websites and blogs. However, if you need more, don’t be afraid to take it. Speak until your audience understands. Sometimes you’ll write blog posts on topics that are more detailed than others. You know your content best. Write until your audience understands what you’re trying to communicate clearly. Edit. Always edit your content to remove unnecessary fluff or add additional points to clarify your message. Use whitespace and remember readability. When writing content, use headings to make it easily scannable to increase readability. Use whitespace to give your audience’s eyes a break while reading. Remember your mobile users, too (SEO depends on it). Hey, we get it. Words are hard sometimes. Especially when you’re trying to find that balance of “just right” content. When you’re passionate about what you do, it’s easy to say too much. And when you’re so close to your service, it’s easy to understand it so well that you say too little. If you’re struggling with your website copy, we’re here to help. Call us today at 612-643-1824 or send us a message online.